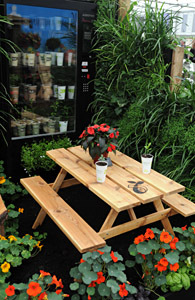 From a disposable cup of tea to a Gold medal and Best Discovery Exhibit, Sparsholt College closes the recycling loop with their sustainable cup-themed garden The Paper Chase at 2014 RHS Chelsea Flower Show. The top medal winning garden, designed and built by Horticulture students at the College, demonstrates the full circle of the re-cycling process – from sapling to tree to cup to compost to garden to sapling. Since last year, students and staff at Sparsholt College’s Winchester campus have been enjoying their drinks from Hutamaki’s environmentally friendly range of disposable cups, BioWare. These cups have all been collected for The Woodhorn Group to recycle them into peat-free compost which grew the plants featured in the College’s garden at the RHS Chelsea Flower Show. Designed and created by a team of 21 Extended Diploma Horticulture students from Sparsholt College, led by lecturer Chris Bird, The Paper Chase is located in the new ‘Discovery’ area of the Great Pavilion. The garden’s five main sections portray a strong environmental message, intended to enthuse and educate everyone with the merits of sustainability, composting and waste recycling; and show a facet of paper production, subsequent use and re-use. From the nursery area with saplings to the cup manufacture in the processing area. A vending scene depicts the cups in use which leads to the recycling and composting section. And the final section of the garden completes the cycle with the compost being used to grow herbs and vegetables. John Young, Huhtamaki’s UK Foodservice Sales and Marketing Director said: “The RHS Chelsea Flower Show is world famous, and it has been a real honour to be involved with such a prestigious event. To be recognised with a Gold award and best Discovery exhibit is a fantastic achievement – not only for sustainability, but as an incredible reward for the hard work and dedication invested by Chris and his students. Sparsholt College Hampshire’s continued success at the RHS Chelsea Flower Show is wonderful, and Huhtamaki is thrilled to have been able to work in partnership with them in the creation of ‘The Paper Chase’. Sparsholt College Hampshire has a long history of Chelsea medal success achieving to date they have been awarded 6 Gold medals, 3 Silver-gilt medals, 4 Silver medals, 3 Bronze medals since 1998.